Annan and Brechin City will have to do it all over again a week on Tuesday after this fourth round William Hill Scottish Cup Tie ended all square in a game neither team did enough to deserve victory, although both teams will look back on decisive moments in the game when they both could have won it . Brechin went ahead 3 minutes before the interval and it is no doubt an incident Annan will look back on with some regret, it looked a harmless free kick that Brechin were awarded 30 yards out but McCausland’s free kick beyond the back post was perfectly placed for full back Colin Hamiton who rose above his marker to send in a header beyond the reach of Alex Mitchell and into the roof of the net. The League One side then almost doubled their lead right on half time but Robert Thomson clipped Paul McLean’s cutback into the side netting. It was the decisive moment in the first half where both teams looked lively enough with Robert Barr posing the biggest threat mainly down the right flank for the visitors and Hopkirk and Todd providing the main thrust of Annan’s attack down the right. Mid way through the half Annan created a superb move in the penalty box with Weatherson’s dummy presenting Hopkirk with a chance but keeper Graeme Smith averted the danger with a good save at the strikers feet. Moments later Hopkirk and Todd combined down the right ending with a deep Hopkirk cross which was plucked out of the air by Smith. Andy Jackson tested Mitchell in the 27th minute when he latched on to a Barr pass but the low shot did not really test the Annan keeper. Annan broke from defence with a swift move down the left in the 36th minute culminating in a Flynn effort which McCormack did well to block to avert the danger. Peter Weatherson’s free kick after Hopkirk had been fouled just after the break was well read by keeper Smith. Brechin forced a couple of corners which were well defended before David Hopkirk missed the chance of the match when Josh Todd’s dangerous low cross only needed a touch from Hopkirk but the Annan striker failed to make any head contact on the ball and the opportunity was lost. 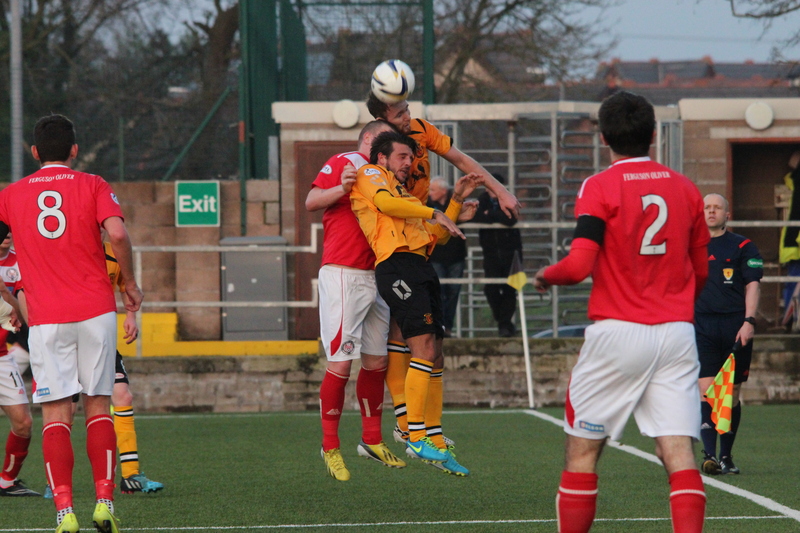 Brechin replied with 3 successive corners which were all resolutely defended by the Annan defence. Jackson was booked for a rash challenge on Hopkirk in the 57th minute but from the resulting free kick the Brechin defence cleared the ball over the top of the Annan defence but unfortunately the ball bounced off the back of Robert Thomson who looked to have taken up a good position. It was a let off for Annan but within 2 minutes they had squared the match with a well executed goal. Ryan McStay done the damage with a superb ball into the path Hopkirk down the right and the ball was whipped into the near post and was superbly intercepted by Matty Flynn who nipped in ahead of McLauchlan to guide the ball into the net from 6 yards. Bobby Barr responded for the visitors with a shot which did not really test Mitchell and in the 74th minute Flynn’s net bound effort was tipped over the bar by Smith. Brechin’s Alan Trouten missed a half chance when he blasted over the bar in the 80th minute and in the 85th minute Annan had a huge slice of luck when Andy Jackson’s well struck effort thundered off the upright. The final minutes were pulsating with both teams going all out for the winner but in the end a draw was possibly the right result with the balance of power tilting in the favour of Brechin who now hold ground advantage a week on Tuesday. ANNAN ATHLETIC: Alex Mitchell, Steven Black, Iain Chisholm, , Martin McNiff, Peter Watson, Steven Sloan , Matty Flynn, Ryan McStay ( S Logan 77 min), Peter Weatherson, David Hopkirk, J Todd. Subs not used Craig Murray (GK), Scott Davidson, Keiran Brannan, Robin Omar, Jordan Brown, Dan Wood. REFEREE: Barry Cook, Assistants John McCrossan and Simon MacLean.